that includes both a carbonyl and a hydroxyl functional group. The functional group is linked to an alkyl group or an aromatic ring. The general formula for carboxylic acid is CnH2n+1 COOH (n ≥ l or simply R COOH where the 'R' refers to an alkyl - or aryl group. Carboxylic acid derivatives are the group of compounds in which the -OH group in the acid has been substituted by the other groups. 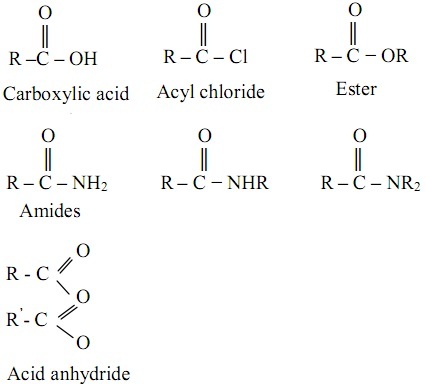 Esters encompass an -OR group, acyl chloride have the -OH substituted by -Cl bonded to the carbonyl carbon atom amides have an -NH2, -NHR or NR2 group bonded to the carbonyl carbon atom whereas acid anhydrides encompass the -O2 CR group. The Carboxylic acids are named from the corresponding alkane, via replacing the ending '-e' by the suffix '-oic acid'. The numbering of the carbon begins by the carbon atom in the carboxylic acid functional group. 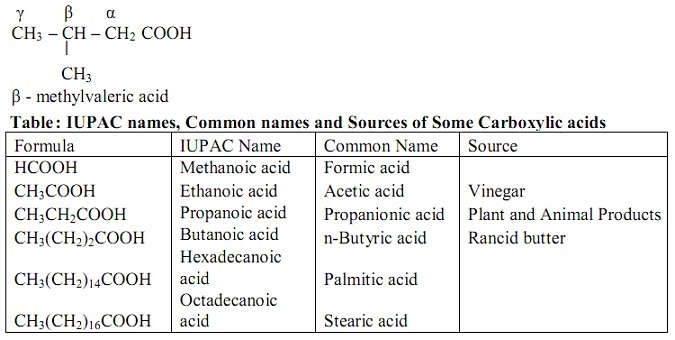 The common names of carboxylic acid are usually derived from the Greek or Latin name of their source of origin. The positions of substitution in the hydrocarbon chain are represented by the Greek letters α, β, γ and so on, instead of numbers. Acyl chlorides are named via replacing the ending '-e' from the corresponding alkanes name by '-oyl chloride'. R and R' might be similar or different alkyl groups. Esters are termed as 'alkyl alkanoate'. The 'alkyl' is derived from the original alcohol whereas the 'alkanoate' is derived from the carboxylic acid. 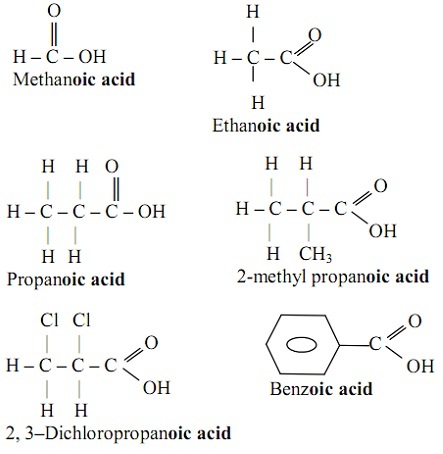 They are the derivatives of carboxylic acids by the general formula. 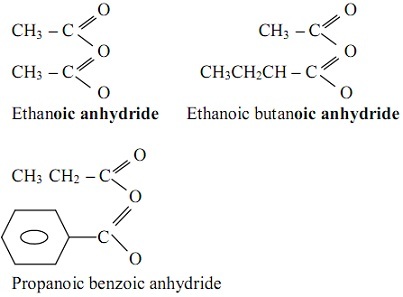 Acid anhydrides are termed as carboxylic anhydride by the suffix '-oic anhydride'. Whenever an amide has subsituents on its nitrogen atom, the prefix 'N' is employed. In the structure of carboxylic acids, at carbonyl linkage, there is the mesomeric withdrawal of electrons away from the carbon atom towards the more electronegative atom making a relative positive charge on the carbon atom. 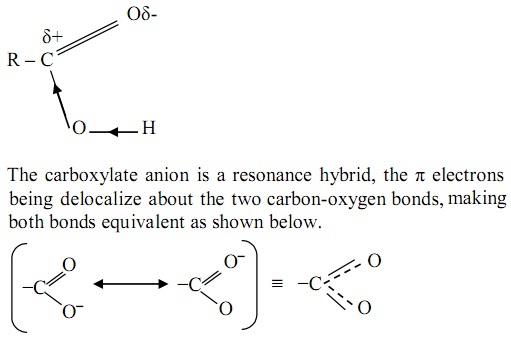 This deficiency of electrons about the carbon atom builds up the inductive pull of electrons away from the hydrogen atom in the oxygen-hydrogen bond improving the stability of the carboxylate anion, RCOO-, and promoting the discharge of a proton. The whole simple aliphatic carboxylic acids are liquids at room temperature. They encompass a characteristic pungent smell and sour taste. The aromatic acids are crystalline solids. The boiling points of carboxylic acids rises by relative molecular mass and they are higher than those of the corresponding alkanes however lower than that of alcohols. Aromatic acids encompass higher melting points than their aliphatic counterparts of comparative molecular mass. The first four aliphatic acids are fully miscible with water due to the capability of the functional group to form hydrogen bonds with the water molecule. Though, the higher homologue becomes progressively less soluble in water as their greater hydrocarbon. Benzoic acid is only slightly soluble in the cold water however dissolves reading in hot water. All carboxylic acids can be dissolved in appropriate organic solvents. Usually, density of carboxylic acid reduces with the increase in the relative molecular mass. Volatile aldehydes and ketones are flammable. The simple ketones are less toxic than simple aldehydes.